As long as there has been war, there have also been tiny figurines with which children can play war games. These now-antique toy soldiers have come to be used by military and civilian parents alike as a means for children to come to terms with and normalize the events of the wars constantly happening around them. Although many of these antique toys have a bit of wear and tear, a lot of them are in near-perfect condition, preserved for the ages thanks to modern-day antiquers around the world. From buying at auctions and estate sales to selling on Etsy and eBay, antiquing is still a popular pastime for people around the country. Because of this popularity for antiquing and America's propensity for war, there have been many iterations of what is now considered antique toy soldiers to have hit the marketplace. Journey through the following images and discover the history of these military figurines from the three biggest producers of the 1940s, 50s, 60s, and 70s: Barclays, Manoil, and Britains Deetail. 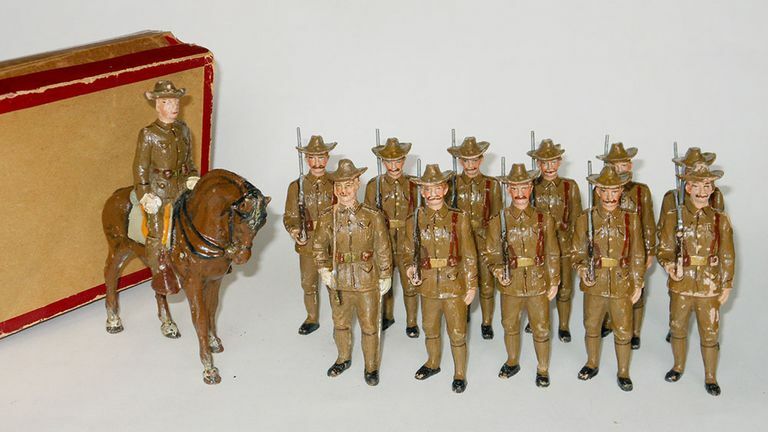 Many antique collectors have recently moved to the pages of the famous resale and wholesale antiques and crafts marketplace called Etsy, whose sellers offer a variety of vintage toy soldiers like the ones pictured above. According to the seller, "These figures were produced following the war and were popular boys' toys for mock-war play during the 40-50s. No longer produced, they are collector's items. Produced between 1940 and 1959, these lead toys wouldn't be considered safe for children nowadays due to concerns over lead poisoning, especially in paints like these. Barclay was a popular brand in the late 1940s for producing toys likes this Manoil toy soldier, item #M199, "Soldier With Gas Mask And Flair Pistol," which depict the real grit of war and the day-to-day operations of soldiers. Barclay and Manoil—who often partnered together—made up the majority of the producers of toy soldiers in a post-World War II world, with Britains Deetail breaking on the scene much later in the 1970s to rival these two companies. In the 1940s and 50s, though, there wasn't much variation between the two friendly competitors and as a result, most of the post-war toys shared similar features and were made of the same toxic lead. Barclay and Manoil were also simultaneously responsible for a number of other children's figurines including zoo animals, city workers, and a barnyard set and both companies became renowned for their collections in their own rights. As soon as the 1950s, toymakers like Marx, a newcomer to the miniature soldier game, began making plastic toy soldiers in the dark green shade most children of today can find by the bin-full at the supermarket. Still, the originals are worth a bit more than their modern counterparts, if bought in a near-mint condition like the ones linked above. These army men embody the American ideal of our armed forces, and for the first time, these figurines depicted the servicemen in action. Marx also came out with a line of Technicolor cowboys, Native Americans, and spacemen in the 1960s, though many of these that are available online for purchase have pieces missing or are slightly damaged—kids in the 60s got the full use out of their toys! On the other side of the pond and nearly 30 years after its American counterpart, Britains Deetail broke onto the scene in the 1970s with colorful soldiers like the one pictured above, following the trend potentially started by Marx and MPC Plastics' army men listed above. Though not considered antiques—which technically only includes items made before the 1970s—these toys became a smash hit in the United Kingdom in tandem with Britains Deetail beginning production of animal and civilian figurine production. Sets like the mounted horses were popular with young and old alike for their realistic impressions of soldiers in the heat of battle, and the coloring and detail were much more refined than their predecessors, leading to a new way of figurine collection. Unfortunately, since Britains Deetail is not considered vintage (yet), they do not maintain much value today and a full set of these pieces can be acquired on Etsy for a reasonable fee. Since the 1940s and largely due to the advancements in commercial manufacturing, toy soldier figurines are now more detailed, lifelike, and versatile than ever—but the classic 1950s Marx green plastic army men still maintain their popularity among young American boys to this day. Now, children can also get a huge army tank for their soldiers or build an entire base of operations like one might see in the Middle Eastern battlefronts. 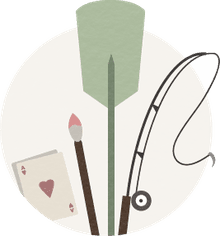 You can even customize your own soldiers on some websites, especially relevant for people who play tabletop games that require keeping track of a player's character's movements.